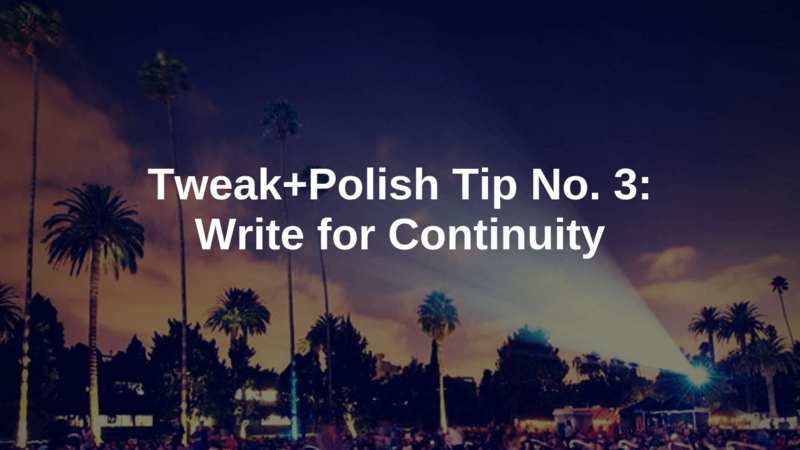 The Tweak + Polish series looks at some of the last layers to consider in your screenwriting process. These tips can make a big difference, and are relatively simple or easy things to implement, but should definitely be reserved for later stages of writing (or rewriting). You don’t want to sweat the small stuff too early. What is writing for continuity? In our writing, we want the same effect. When someone reads a scene, they should be able to follow what’s happening continuously and without confusion. This includes description of physical space, choreography during the scene, who’s in the scene and who’s speaking, etc. Now, we could talk about writing for continuity in terms of not confusing the reader as you move from one scene to the next – that’s important too. But for today let’s focus on continuity within a scene. That’s where most of the issues seem to happen. Add up too many little bumps, and you’ll have frustrated readers. Did you catch that? Characters are established in the description, so that’s the image we’re holding in our heads; that’s what we’re “watching”. And then some other character pops in with a line of dialogue. Who’s that guy? Where did he come from? That’s not to say this is always the “wrong” way. Sometimes you want an unseen character to speak (although you’d probably want to establish he’s off camera in that case), or to purposely jar the reader’s attention. But it’s important to understand the effect you’re going for and the effect you’re achieving on the page (and to make sure they’re as closely aligned as possible). As you direct the reader through the scene, are you maintaining a clear narrative flow? If you surprise or jar the reader, is it for a deliberate and necessary purpose? What we’re talking about with “writing for continuity” comes down to clarity — effectively the golden rule of screenwriting. Clarity is one of the biggest distinctions between amateur and professional scripts. Any degree of confusion, vagueness, or murkiness is a quick way to lose your reader. If it’s necessary to re-read the words on the page in order to understand what’s playing out on screen, that’s a red flag. Clarity means controlling the flow of information. You can also use things like CAPS and minislugs – sparingly and with purpose – to move the reader through scenes. Done well, this conveys a sense of the flow of images in the movie – which is the goal of writing for continuity.